In a tree-lined Historic Neighborhood near downtown West Palm Beach, our condos are quiet and centrally situated - you are near to EVERYTHING! Near the beautiful beaches of Palm Beach and the intracoastal waterway, you can enjoy museums, adventure parks, restaurants, and world class shopping. There's plenty of reason to wear out the soles of your sandals. Though we are only a short drive to the international airport, the only reason you'll find to return home is for a rest from your memorable tropical adventure. We loved the classical Florida architecture of the tree-lined neighborhood. It is located half a block from a beautiful park with ancient banyan trees, yet a short walk to all the entertainment of a vibrant city. We called it Parrot's Nest for the flock of red-headed parrots feasting on the sea-grape tree shading the parking lot. We are 2 miles from the white sands of Palm Beach. A flat, very pleasant direct bike ride to the beach. 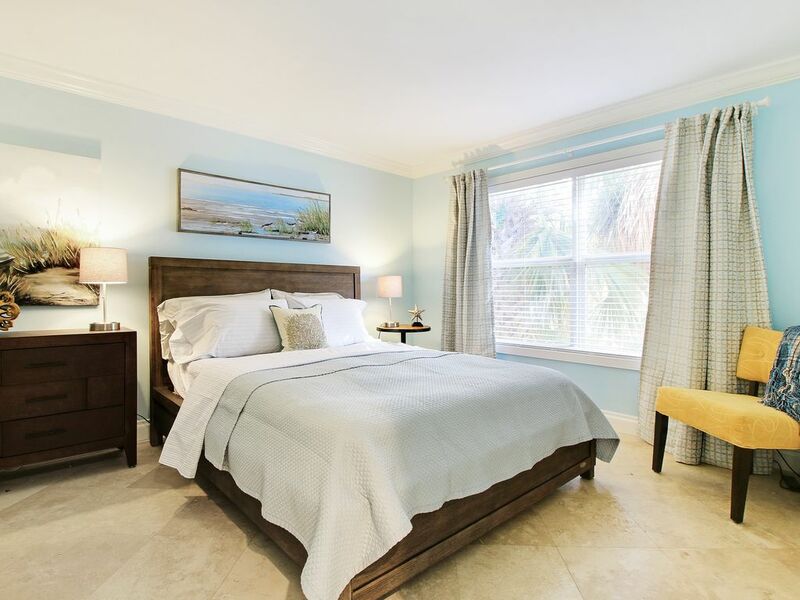 Situated in a quiet, tree-lined historic neighborhood of Downtown West Palm Beach. Only a short 2.0 mile scenic bike ride to the sands of Palm Beach. The experience at this condo was absolutely amazing from the moment we arrived until the day we left. We stayed for six weeks and have already booked again for next year. Carlos met us at the condo and did a walk through with us and was very welcoming and helpful. There was milk and juice left in the refrigerator as well as coffee and snacks so that we wouldn't have to worry about shopping right away. The condo was clean, bright and beautiful and fully stocked. They had everything you could need and more. The decor is beautiful and the condo and the entire building is very well maintained. Did I mention the place was clean? It was so clean!! The bed was very comfortable and William made sure we had plenty of crisp, clean bedding. Carlos and William were great hosts and we can't wait to go back next year...and as many years as they will have us! Thank you both for such a wonderful experience!! Lived up to, and exceeded our expectations. The unit was immaculate and beautifully decorated. Carlos greeted us when we arrived and showed us around. Both he and William were very welcoming and provided us with many little touches that made our stay even more enjoyable. The condo is situated in a lovely historic area and within walking distance to a large park and City Place in downtown West Palm. We would most definitely stay there again. Location and apartment perfect. Very recomendable. Clean, tidy, very helpful hosts, quiet area close to city place. Great place in a nice quiet neighborhood with a park close by and convenient parking. Great stay and our hosts were most accommodating. The units were meticulous, well cared for with impeccable decorating taste. We enjoyed all the comforts of home. Parrot's Nest is a boutique Condo of six units, all of which we own. It is located in a tree-lined, historic, residential neighborhood of West Palm Beach named Grandview Heights. It is a unique upscale community characterized by mostly renovated homes built in the 1920's of traditional south Florida architecture. Young families comfortably stroll about the streets, on their way to the lush Banyan tree shaded local park. Even though the conveniences of a vibrant city are steps from your door, you are rewarded with peace and quiet----walking distance to City Place with many restaurant and lots of entertainment, Convention Center, Kraviz Performing Arts Center, Norton Art Museum, many chef-owned restaurants, Antique Row, tennis courts, parks, central library, the intra-coastal, white sands of Palm Beach...Near the zoo, Wellington Equestrian Center, many other beaches.